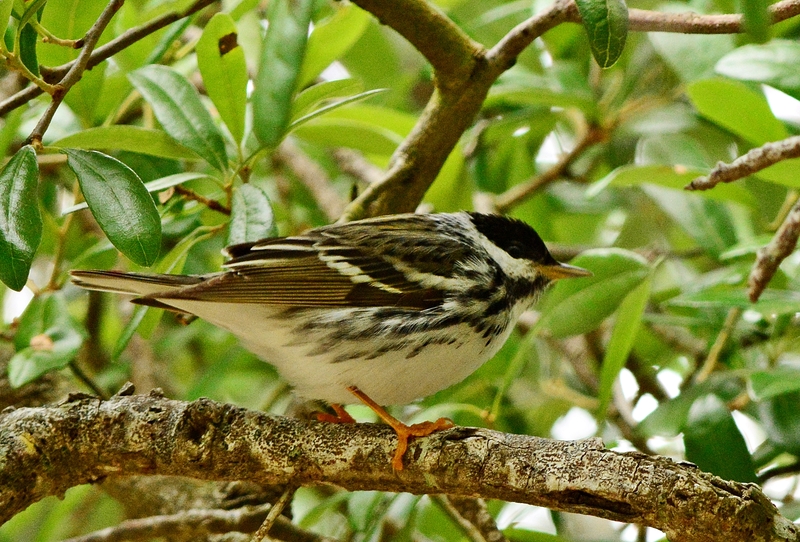 My first blackpoll warbler of the season. 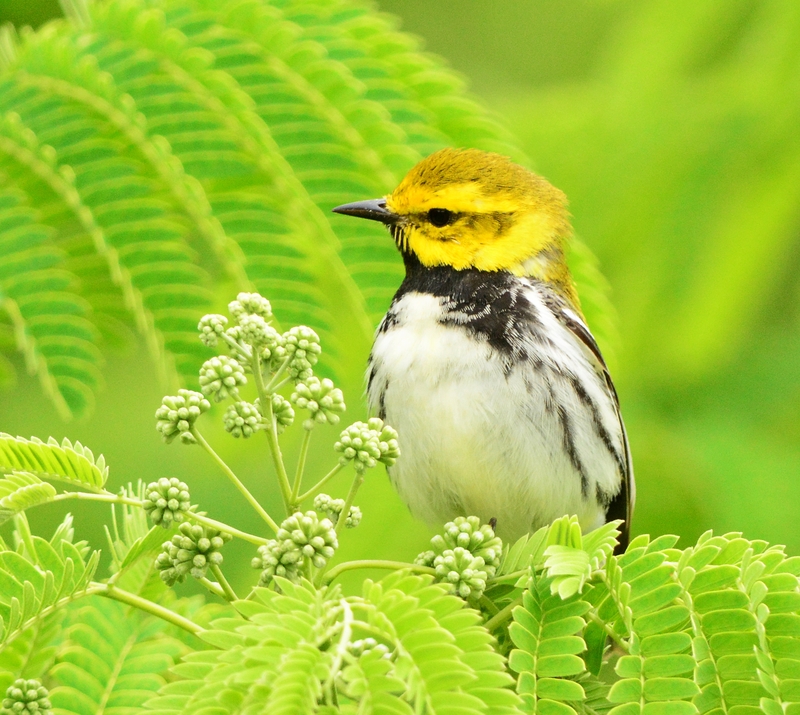 Cape May warblers were everywhere. 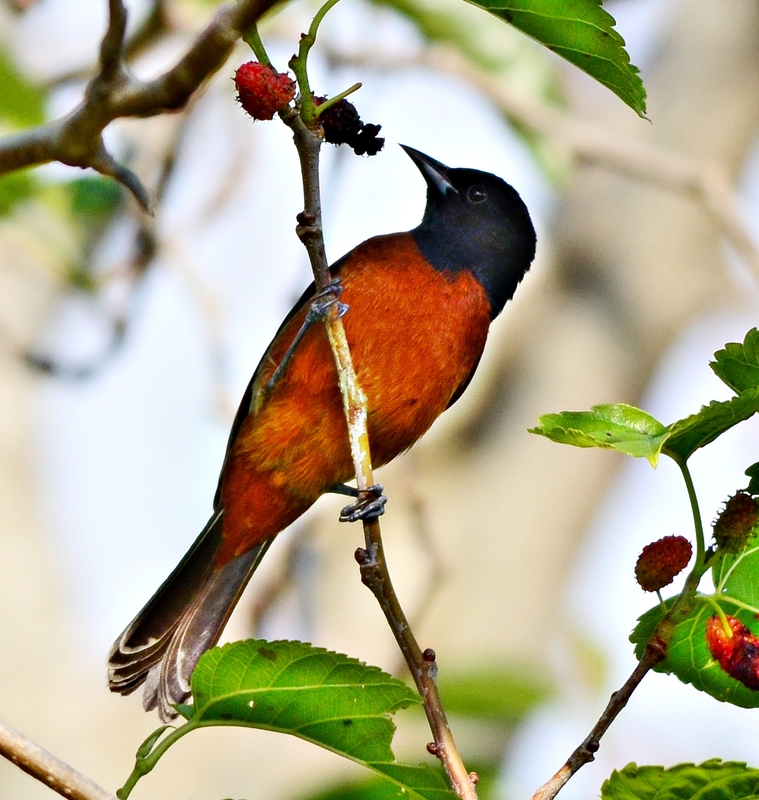 A first-summer male orchard oriole with mulberry stains on his chest. 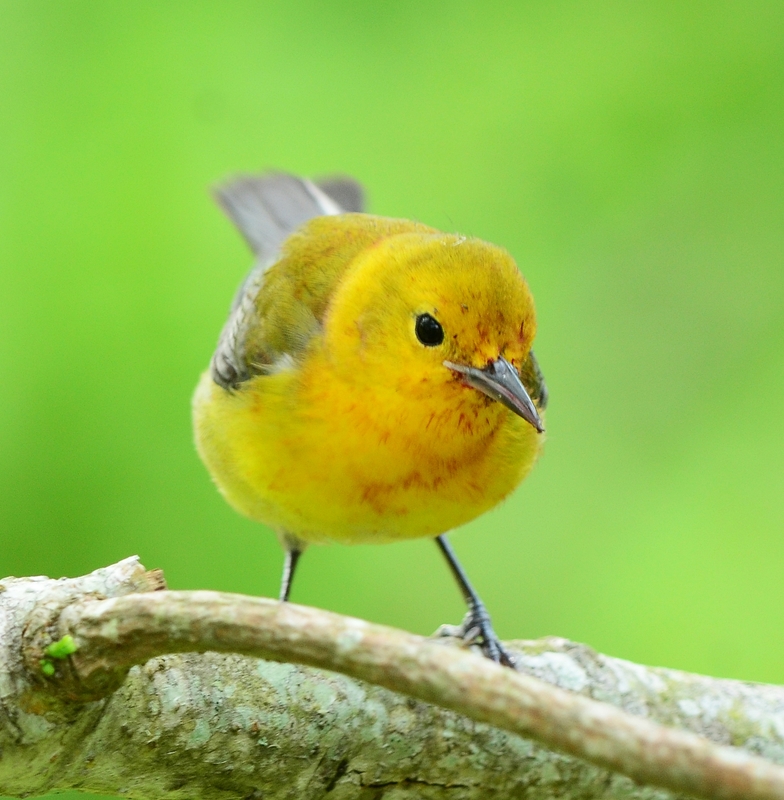 I think this is a first year female Baltimore oriole. 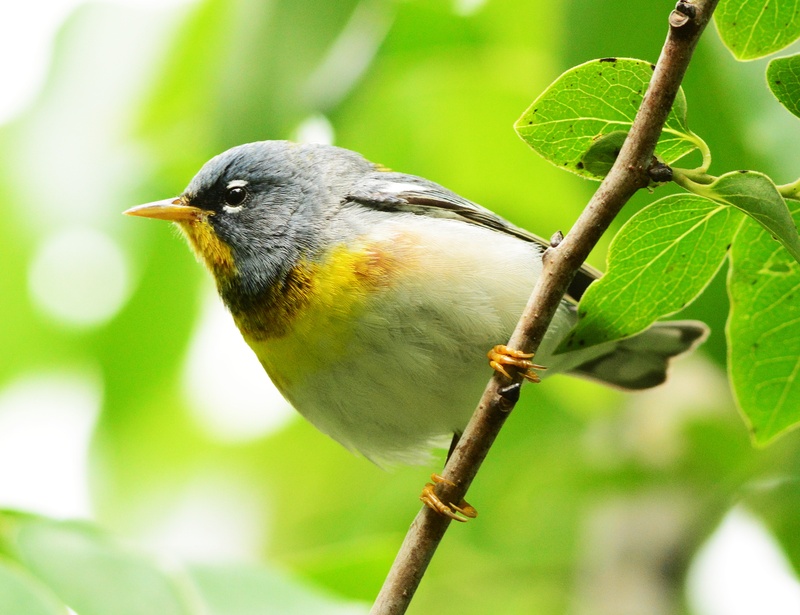 I saw one northern Parula that morning. 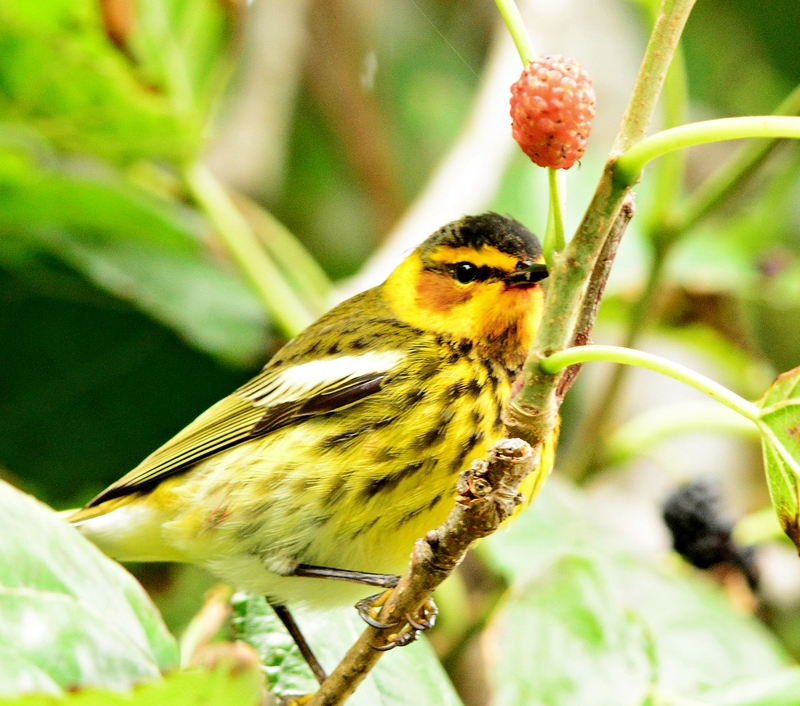 My first black throated green warbler. 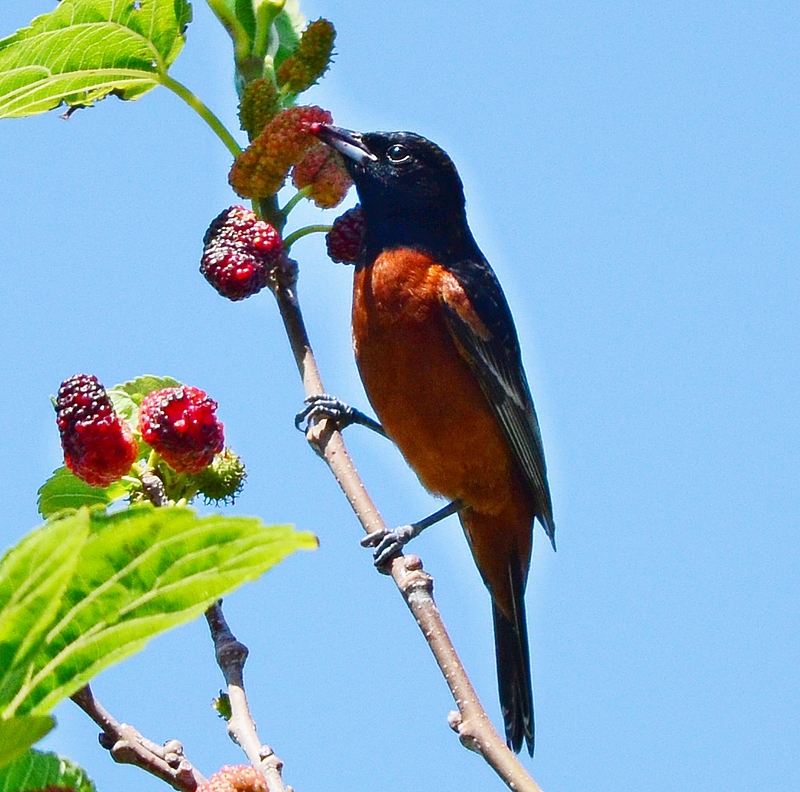 A male orchard oriole taking a berry break. 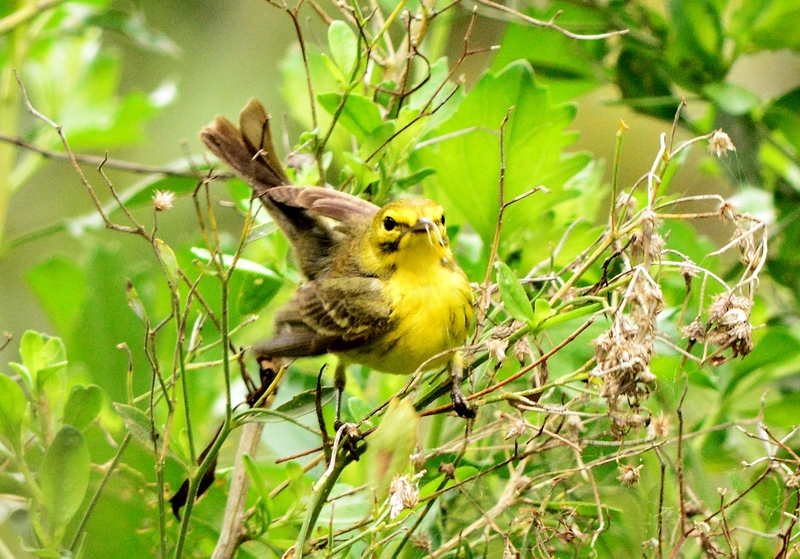 Prairie warbler doing some weird acrobats. 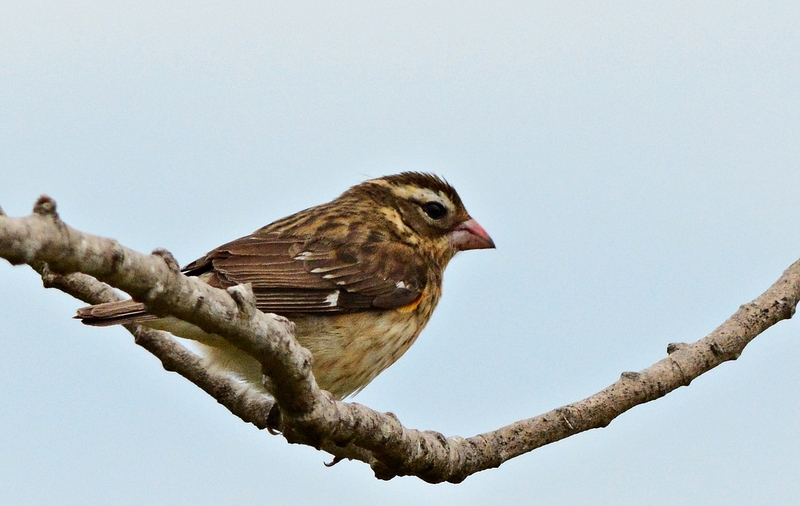 A female rose breasted grosbeak. It was a busy day in mid-April. A big fall out day. 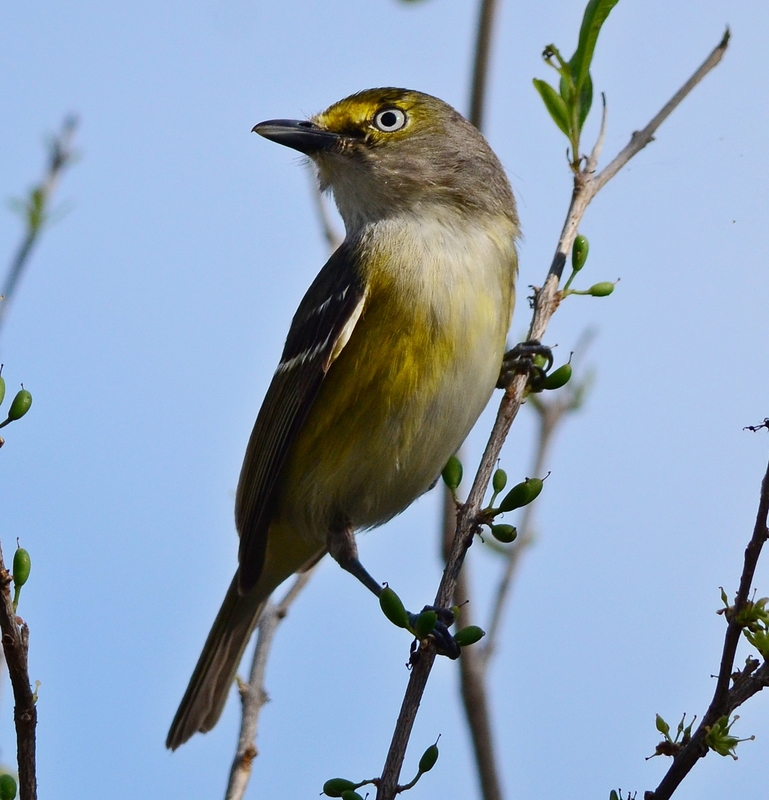 Spring migration was in full swing and I knew I’d come home with a neck ache from staring up in the trees all morning. I was right. Birds were everywhere but they did not sit still very long. There were almost as many people at Fort Desoto that morning. Everyone was yelling out bird names: “there goes a female blah blah”, ” I just saw an immature male blah blah”, ” has anyone seen the yellow blah blah?” All of the little birds were starting to looking alike, especially the yellow and brown ones. Let me know if I got any of the above wrong. 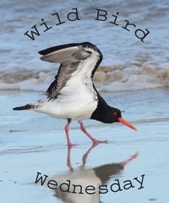 People had driven from all over the state to check birds off their list. I met a ton of new people and ran into people I hadn’t seen since the last migration. It was catch up day. The next couple of weekends still had a few birds but not like this big weekend. 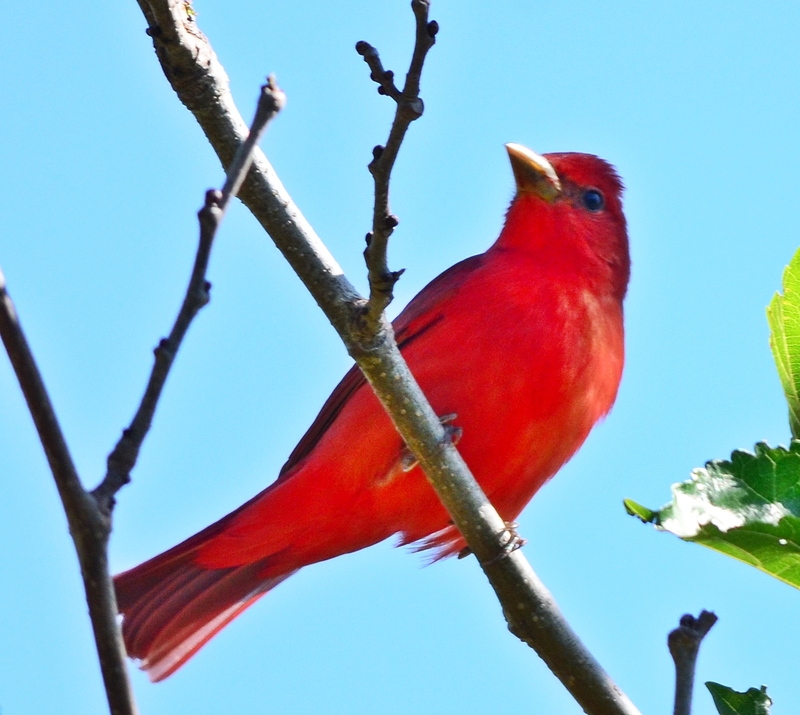 I also saw a lot of little red birds and blue birds. More on those later. 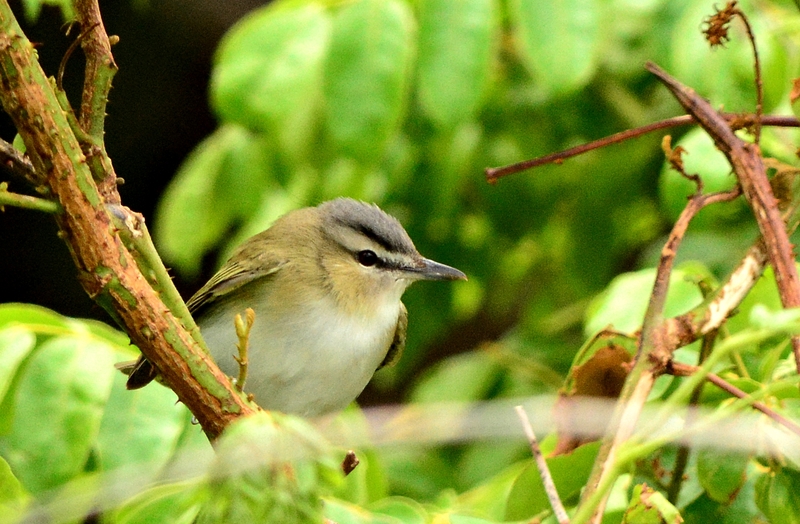 White eyed vireos were all around Fort Desoto. 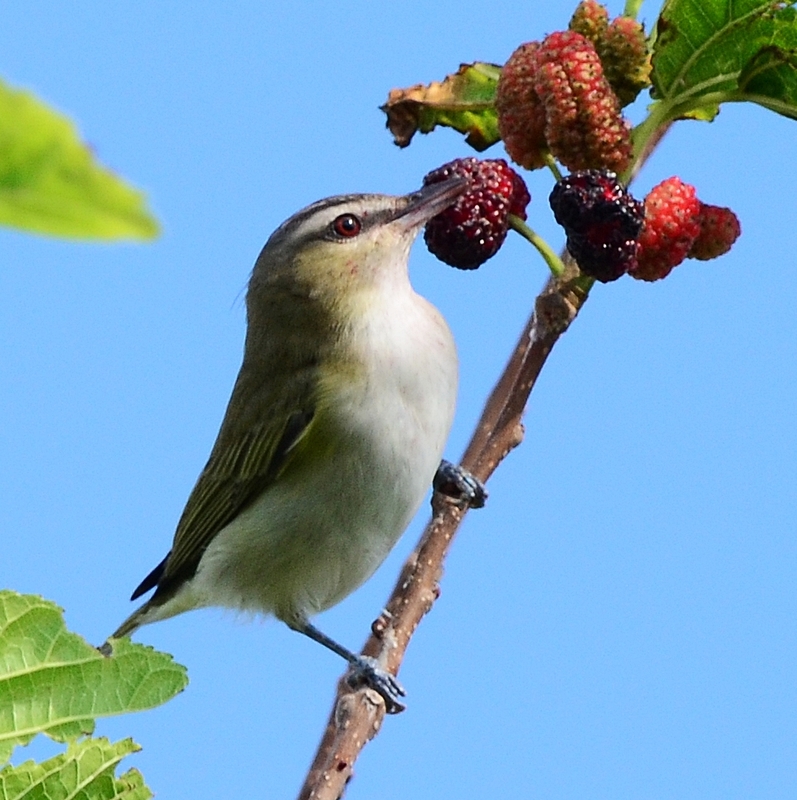 My very first red-eyed vireo. 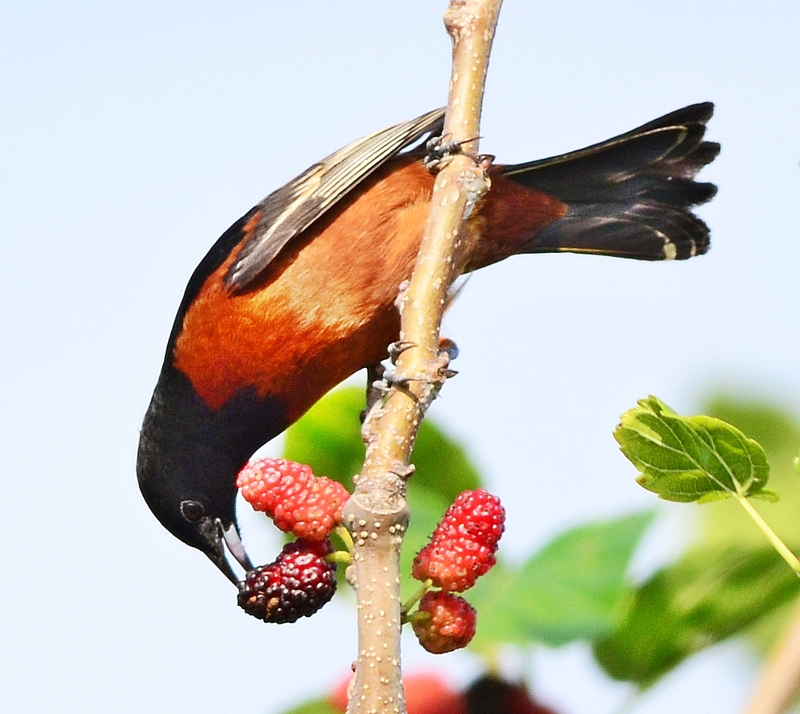 His beak was stained red from the berries. 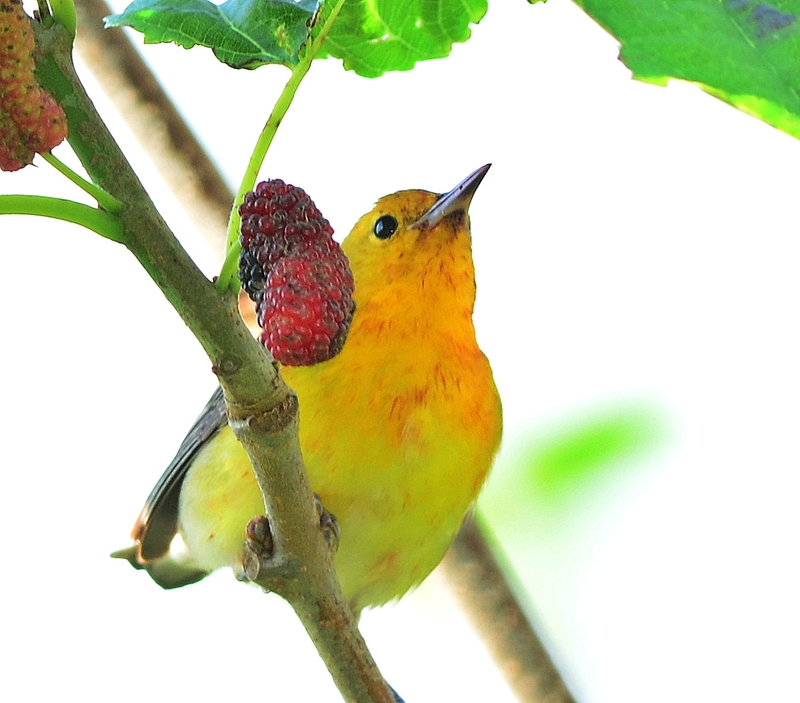 Prothonotary warbler all covered in berry juice. Another one getting ready to chow on the berries. He’s going to need a bath after this feast. 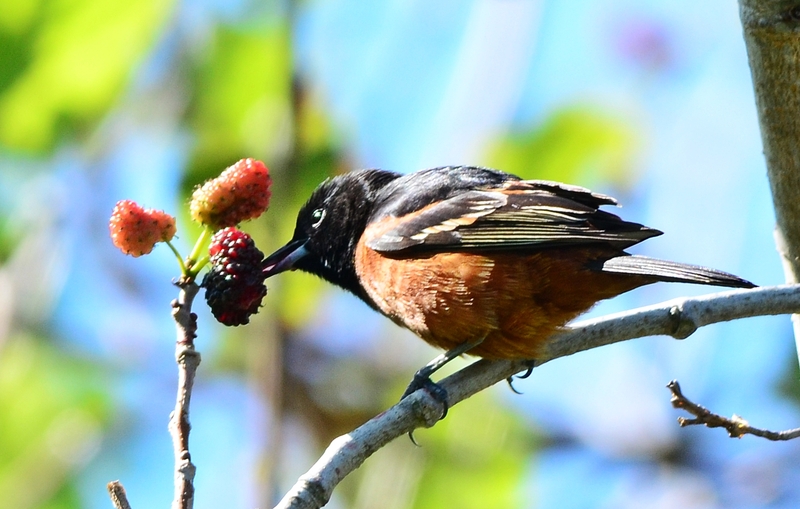 Orchard oriole getting a bite. 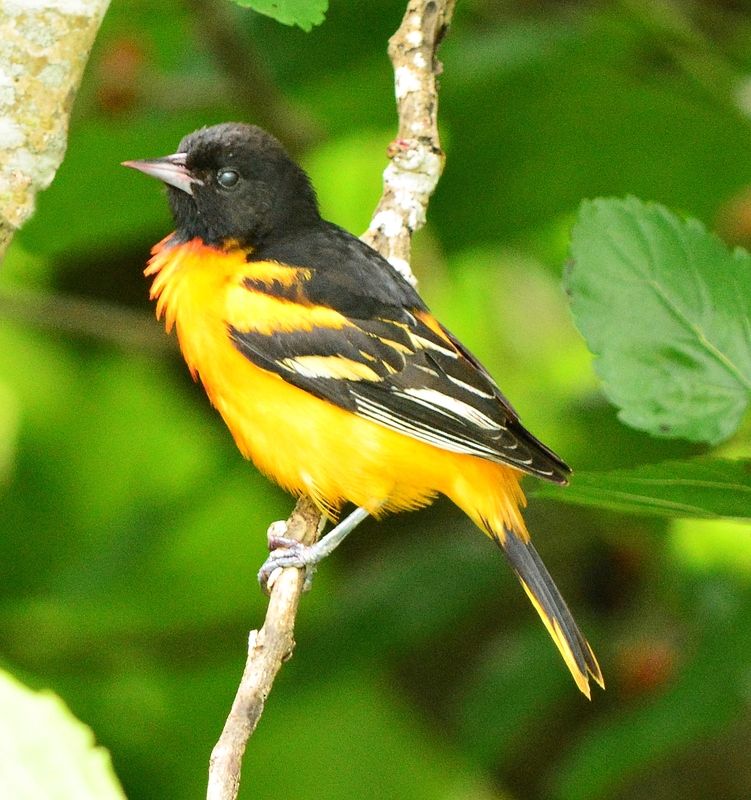 Another oriole high up in the tree. 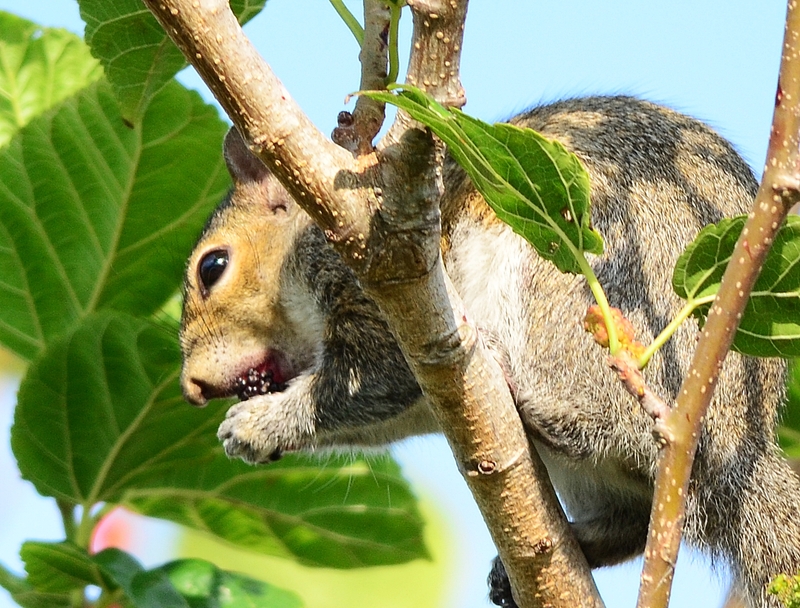 Even the squirrels were eating the berries. 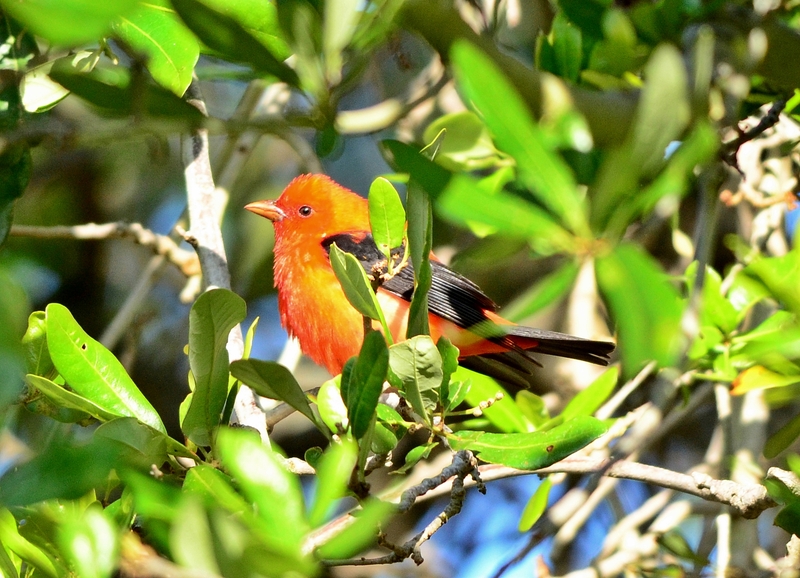 The mulberry bush area at Fort Desoto was a fly-in fast food place in mid April for birds migrating north. 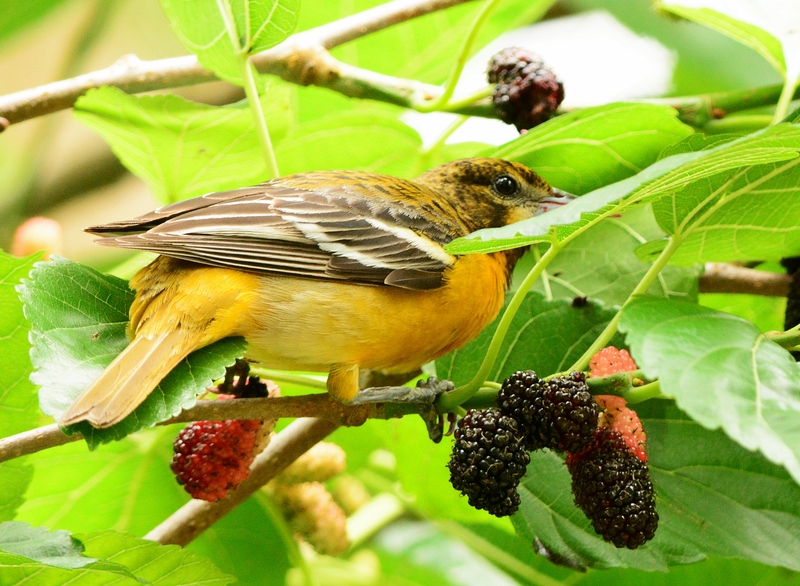 I had never even heard of a mulberry until last year when I kept hearing about the bird traffic at the mulberry bushes at Fort Desoto. I’ve never eaten one but they look like they would taste like a raspberry or blackberry. One interesting thing I read about them on Wikipedia is that some North American cities have banned the planting of mulberries because of the large amounts of pollen they produce, posing a potential health hazard for some pollen allergy sufferers. No wonder I kept coming home with nose bleeds after spending hours walking around the bushes. This was the 2nd weekend I had spent at the park looking for little birds. 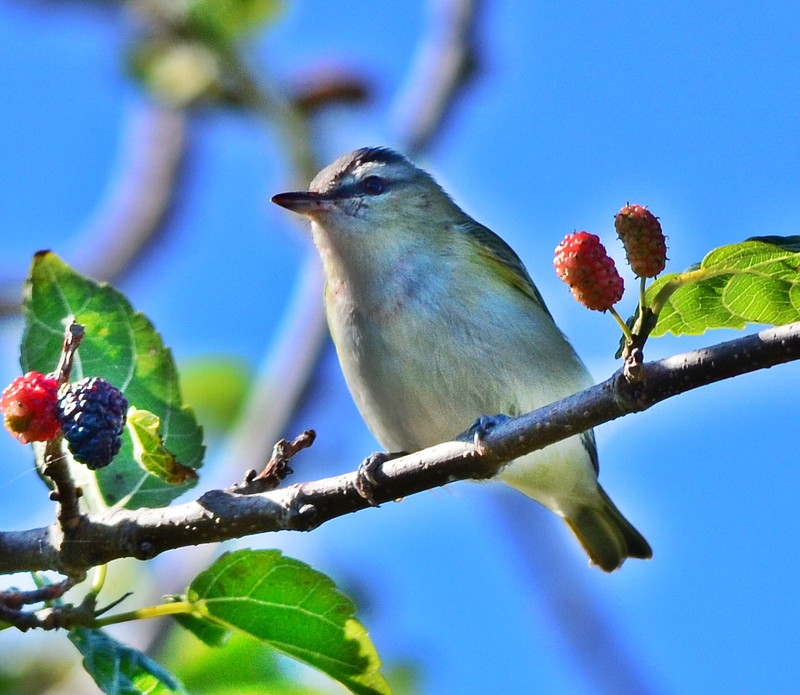 This day I was able to see my first red-eyed vireo. 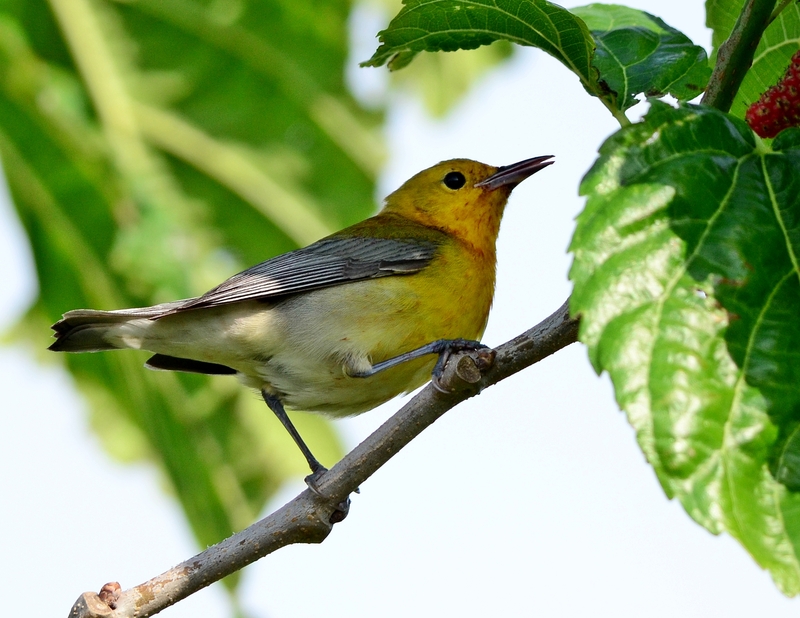 I was getting bird nerd neck pain from staring up in the trees for hours at time. That’s okay, small price to pay for seeing these beautiful fun birds. I can spend the rest of the summer resting on a float in the gulf recouping as the dolphins and manatees swim by (all while keeping an eye out for stingrays and sharks). 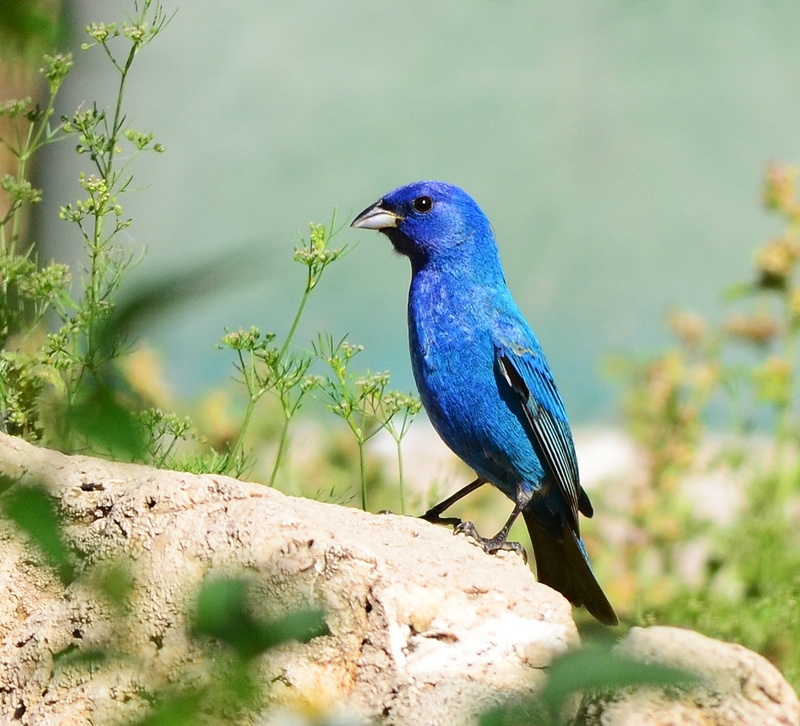 I think the indigo bunting was my favorite bird of the day. Last spring I could not get a decent picture of him. When I first got the woods I saw a flash of blue and didn’t see him again for a while. Later, while standing in front of the fountain talking to some other birders, he landed right on the base of the fountain. He bounced around for at least 10 minutes from branch to fountain. I totally blew this shot out. I had been taking pictures of birds deep in the bushes early in the morning and had my ISO too high. When I drove over to the other section of woods, as soon as I got out of the car I saw the scarlet tanager in the tree and immediately started snapping. Then I realized he was in full sun and I hadn’t lowered my ISO. A second later he flew off. So the shot overall is too bright but I’m just glad I got him. This one I took right into the sun and then had to blow out to get the details. I think this is another scarlet tanager but we had heard there were summers around and I was hoping it was a summer instead. I can’t really see his wings in this picture to tell. Any experts have an opinion? 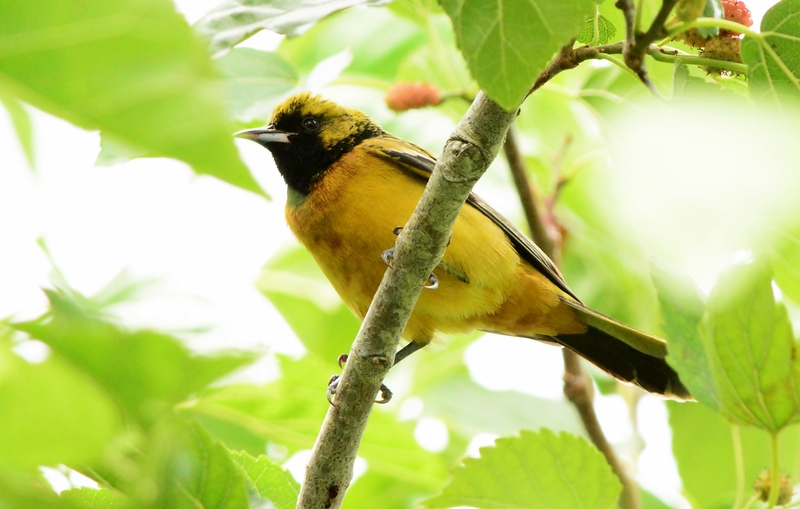 Later in the morning, when I came back to the mulberry bushes, they were full of orchard orioles. I only saw males while I was there. They were all busy eating the berries. Another one with berries pieces in his beak. 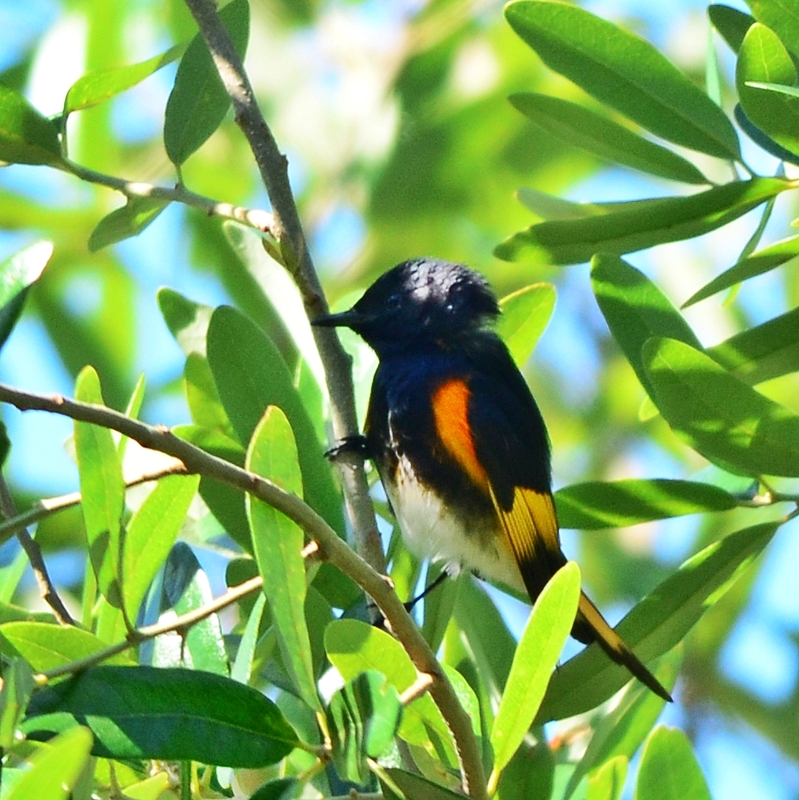 Not a good picture but it was the only one I got of an american redstart. Is this a gray kingbird or an eastern kingbird? People were calling it both. 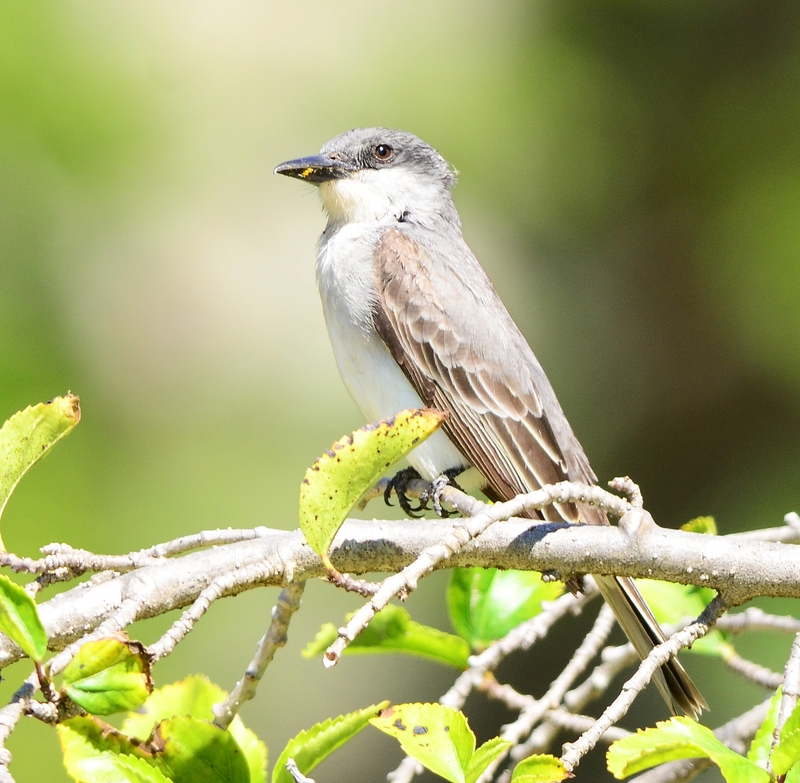 All About Birds does not even show a gray kingbird in their list, only the eastern. 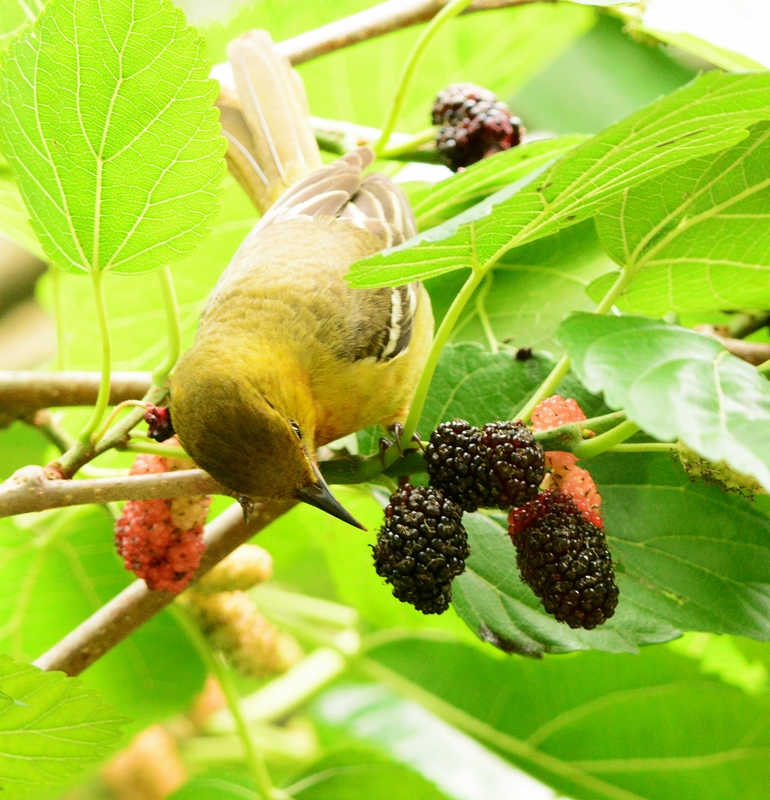 He was flying back and forth between the mulberry bushes with some lunch left on his beak. 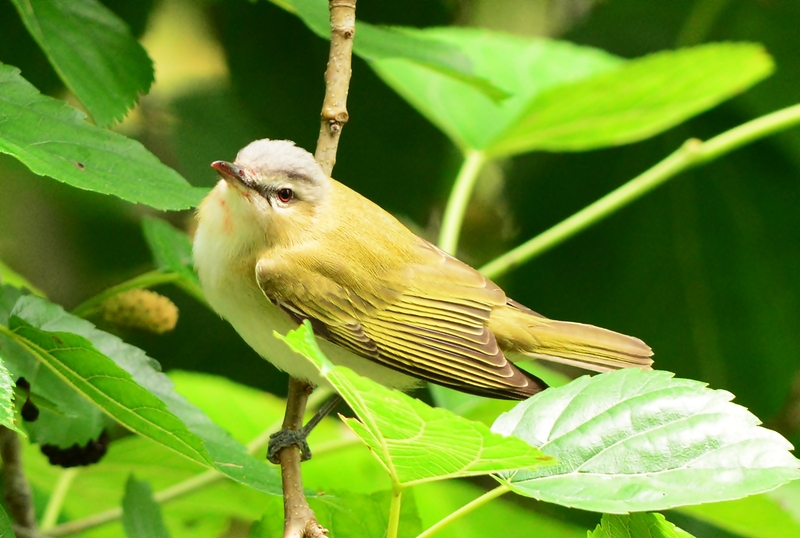 My first red eyed vireo. 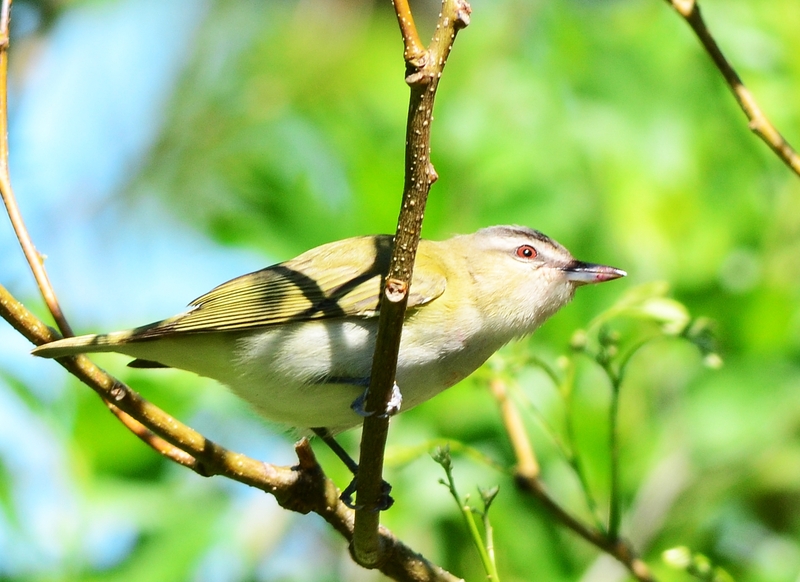 I thought this was a red eyed vireo at first. I’m thinking it’s the same bird as the picture before it and that I just couldn’t see it’s red eye. It also looks like a female redstart. 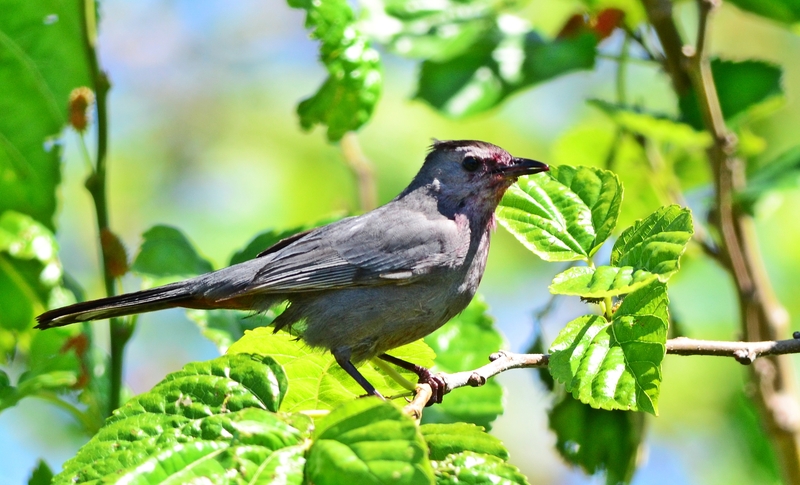 The very common gray catbird. The mulberry bushes were full of them. 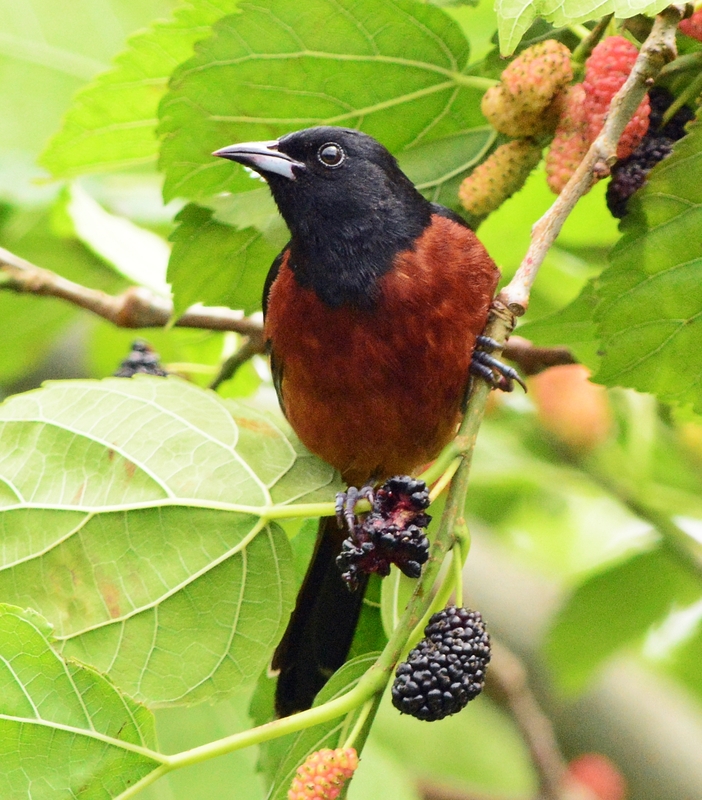 This one had red all over his face from eating the berries. What a feast. The mulberry bushes at the trails have signs posted saying “Do not pick the fruit.” Just in case a tourist wanted to have a snack and wipe out an entire bush. The birds migrating through in spring count on these bushes for fuel to get them home up north. They are exhausted and hungry when they stop by Fort Desoto for a rest. 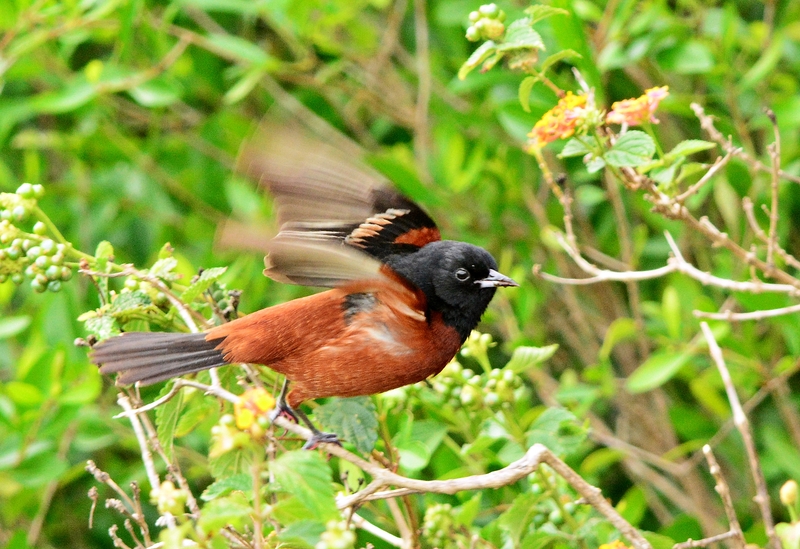 The bushes were full of birds in early April. They were all busy eating and most birds had a little berry juice stained on their beaks and faces. 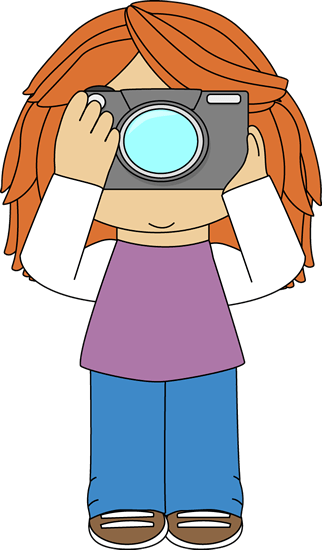 Most of these pictures were taken standing in front of the big mulberry bushes or at the water fountain so I didn’t have to travel far. Just stand in one place and have patience (which I don’t have a lot of).